Live from the 2011 US Nationals in Greensboro, North Carolina. In addition to capturing some sounds and flavors of the event, there are interviews with: Charlene Wong, Todd Eldredge, Sylvia Fontana and John Zimmerman, Alison Carey, Rusty (the In-Arena Host) Dan Diamond, Kori Ade, John Lee, Michael Parsons, Doug Razzano, Jerod Swallow and Ben Agosto. 1 hour, 2 minutes. Win a DVD/Booklet set of the Moves in the Field training materials! There is a contest running with this podcast: win $55 worth of a DVD and booklet set from The Professional Skaters Association. Great for all the coaches out there! To enter, send me either through email or my Facebook page the answer to the following question: Who is the Executive Director of the PSA? All entries received between February 7 to February 28, 2011 are eligible. The winner will be picked at random from all correct entries sent. Click here to learn more about how to enter. Charlene Wong: I’m here assisting Danielle Kahle [competing in senior ladies], whose coach is Cindy Bortz, but I’ve been assisting with Danielle for a few years now. So I’m here cheering her on and helping her stay calm. She did a reasonably good short program and I think we’re looking at a personal best in the long on Saturday. Quite honestly, this is a pretty laid-back competition for me, with only one student here, so it’s been very fun for me to watch all the competitors and cheer everybody on. With myself, my coaching style changes a lot from student to student. It may depend on the student themselves and their individual needs. I may teach a student who is between 14 and 16 and at the senior level, but the way I coach them would change significantly when they hit 16 and a different level of maturity. Yuka [Sato] and Brian [Orser], they’re fantastic coaches, and I wouldn’t doubt that their coaching style changes too. Not so much based on the level of the skater but where the skater is at in their individual needs and at their point of maturity and individual development, and technical development. Todd Eldredge: I’m just watching the competition and taking part in some of the events like the Hall of Fame reception. I received some scholarships over the years — skating, financially it’s not the cheapest sport, and over the years I got some funding help from the Memorial Fund. So I’ll go to that event as well. I think you’ll always miss competing somewhat. Do I miss being out there today, no, but I think you’ll always miss it a little bit, because that’s what we grew up doing and what we strived to do and always to do our best. I enjoy just sitting in the stands with a Diet Coke and watching everyone else sweat it out like I did years ago [laughs]. And I’m coaching a little bit, so I get to see what it’s like from the other side of the boards to see somebody I work with go out and skate. Nobody here yet, I’m working just with a couple of little kids right now, but maybe someday. I have a better admiration for what all coaches go through now, just standing there, you’ve given them all the advice you can at that point, and it’s just up to them to go out there and do it. So you just have to hope that they do it [laughs]. Silvia Fontana: We are here with Karisma sportswear, introducing it to the nation. John Zimmerman: We’re coaching as well. It’s definitely different being on this side of the boards. I think Silvia and I enjoy giving back and imparting whatever knowledge we’ve been able to gain. We’re lucky to be able to work with Caydee Denney and Jeremy Barrett, and Haven Denney and Daniel Raad, in south Florida. We’re training down there and that’s our home base. 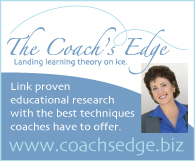 We’re skating a little ourselves, but mostly we coach. It’s been a great transition, it’s been nice, and we’re definitely ready to move on to this stage in our lives. Silvia: We always really work well together. We sometimes look at each other and say, we are always together, but I think because being so much apart because of skating, me being a singles skater representing Italy and John being a pairs skater representing the US — I think we truly complete each other as people and also professionally. John: We’ve been together almost 16 years, and 80 to 90 percent of it has been being separated half the time, competing and training. So I think we have a lot of time to make up to be together. Ali Carey (senior ice dance competitor): We skated first, but it was wonderful. Before we drew [for the skating order], our coach looked at my partner Ryan’s and my hands, and said he liked Ryan’s hands better, so Ryan was the one who drew [laughs]. It was really OK, it was actually fun to get it over with and then watch everyone else compete. This is our first year in seniors together, and it’s been really fun. We came here with no expectations, we just really wanted to put out some fun programs and enjoy the experience and soak it all in. We train in Aston, Pennsylvania, where there’s lots of teams on the ice and lots of teams from all over the world. So we’re used to skating with very competitive couples, and it’s definitely very inspiring. Rusty the “in-arena host”: I am the last of eight kids, so you had to fight for food at the dinner table, and any time you wanted to get a word in edgewise, you had to fight also. So really I am probably the least quick and least funny of any of them, but they all went ahead and got real jobs, so I just took these remnants of talents and started doing this instead. I have much more knowledge of figure skating than I ever thought I would. When I first came on in St. Paul in 2008, I knew absolutely nothing and was literally paging through the program to learn whatever I could. And since then I’ve just been forced to learn about the subject. I’m happy now that I can tell the difference between the axel and other jumps, but I still can’t tell the difference between a loop, a flip, and a lutz. I’m coming along, though. I’ve come a long way. Dan Diamond (vice-president of Fathom Events, involved with the movie Rise): We had been involved with the US Figure Skating Association for some time, and a couple of years ago David Raith and I got talking about a way that we could create to celebrate and honor and remember the 1961 team. And also to talk about what had transpired since, the real rise of US figure skating — really, in a microcosm of a story, what this country’s about, arising from adversity. So we put this event together, and US Figure Skating was very much behind this event, creating a story that we believe very deeply should be told to communities across the country, but also to celebrate the memories of these fantastic athletes and their families by special skating performances. We’ll have a live broadcast in some 500 movie theatres to honor the team. Every time I see [Rise], it gets more inspiring. I knew the story, and I had had the good fortune of spending time with the people down at the USFS in Colorado Springs, and learning and hearing about this. But as a young man growing up, I was six years old when this happened, I remember my family being quite shaken by it, but I couldn’t connect the dots. For me, this has been something, as I’ve gone through this journey with figure skating, that I think is important for every person, young and old, to connect with. It’s not often we get a chance to remember very special people and very special moments that we should never forget. This is one of them. I’ve been on ice many times, but not well. My favorite trick is trying not to fall into the boards most of the time [laughs]. Actually, my kids skate. They play hockey and they do very well on skates. I have never been that athletically gifted on skates, but I’ve always loved it. It takes me back to the time when I used to sit in front of a very small black and white television and watch figure skating with my family, and the rest of the family would come over, and it was a very important thing to us. Those kinds of moments in this day and age, when we all are consuming media in a very individual manner, we don’t get a chance to get together any more. This gives people a chance to get together, and they’re all having the same feeling about what they’re going to experience, and then to meet others with the same interests in the movie theatre — it’s an honor for us to be part of it. Kori Ade (coach of Jason Brown): Jason has proven himself to be a really good competitor, but I didn’t know how the factor of being senior at Nationals would affect him. It pretty much felt like he could bring his tricks and all his Jason-isms. But on the warmup, he said to me, this is different. So there’s a moment of hesitation, but then I kicked into my regular coaching, and said, this is not different. It’s like every other day in your skating world. Just go out there and do what you always do, which is skate a great program, and give the audience what they want. And I think that’s what Jason is starting to do. His idol is Ryan Bradley and I think he really wants to emulate that, to give the crowd that, because Jason’s a pleaser. He never wants to disappoint anybody, so I think he understands the importance of making it a performance in order to please the audience. That’s an important asset that he’s developing. It’s going to take some time for him to really be able to hang with the big boys, but for what we had hoped for tonight, he was actually able to deliver what we thought. I have some kids that need different rituals [at the boards]. I have one who needs two claps, with a pause, two double high-fives, with a pause — I have to know the timing [laughs] — so it’s all choreographed for that boy. But then there are others that just want me to say ‘go get ‘em’. I just try to read, to be a chameleon, and I think because of my 11-year relationship coaching Jason, the thing he needs the most is to remember that I believe in him, and to know that when it’s over, regardless of the outcome, I’m going to be standing there with open arms and it’s gonna be fine. Tonight I sat down while he was doing his 45-minute warm up and I wrote him a three-page letter. All week, while he’s been home and I’ve been here with my novice competitor, he’s been asking for motivational quotes on his text messages. I really avoided doing it, because I don’t want to sound clichéd and say, keep your head up, keep working hard — that’s so generic at this point. I said, I’ll give you your motivational stuff when it’s time for you to hear it. So I sat there and I knew that’s when it was going to hit me, that I had gotten a skater to senior level from march-march-glide. That’s a huge journey, a long, long journey. So I wrote a three-page letter, and I said — I knew that when I met Jason, he presented me with the greatest challenge that I could be presented with as a coach. And I knew that it would take a lot of directing his energy and harnessing his talent, and a lot of education for me. Because I don’t have a strong competitive background, I didn’t intend to be a coach. I intended to have a career in medicine, and I sort of got looped into coaching and had to learn to be a great coach. So I believe in the power of learning, and I believe that having a skater like Jason has allowed me the opportunity to foster that, because I had to. So I don’t know — it’s probably in my personality to keep learning, but I knew because of Jason that I had to do it. It wasn’t a choice, because I care about him. And several times in my coaching journey with him, judges or officials have said, you know, it’s really in his best interests for you to pass him along to somebody. Because I wasn’t a well-known coach, I was a nobody. And I just am really grateful to the Brown family for trusting in me, and believing in me. My favorite story that I tell other coaches is that I had another skater that started with me when she was a beginner, and when she got to the double axel, her mother — even though she made final rounds at juvenile and was progressing really well — sat me down and said, you know, we think you’re wonderful, but we know you’ve never taught a double axel before, and we don’t want our child to be the guinea pig. And I remember those words so vividly. It was a pivotal moment for me, because it was at that moment that I said, I need to go learn, because I will never have this conversation again. Ever. And I think that’s what forced me to seek out apprenticeships and to find people that I knew I trusted to guide me. And there have been a lot of people along the way who have said, you can’t do it, or, you don’t know what you’re talking about. And I think as a coach that hasn’t proven themselves, I’ll be up against that for the next ten years, and I’ve been up against it for the last ten years, but if it’s your passion, which it has become for me, you just keep your head up, and you keep showing up every day, and you’re consistent with what you do, and you find people that know a little bit better, and you just learn. And I have to say, I’m probably the biggest nerd there is, because I spent five years at Lake Arrowhead with a video camera and notes, sitting on the side of those elite sessions, watching those elite coaches teaching, and taking notes, and then going with my video camera and filming the tracings on the ice and figuring it out. I’ve probably spent $100,000 figuring out how to be a better coach. To me, that’s my master’s degree, and I think that’s what Jason has done for me, to force me to be the best coach I can be, and I thank him for that. Because if I didn’t have a talent like that, that I had to stay one step ahead of — that was the bulk of my letter. Congratulations on getting here, I’m so proud of you, thank you for letting me be on this journey with you, and it’s amazing that you have pushed me to this level. That’s cool that you asked me that question, I’ll let you read the letter [laughs]. John Lee (shuttle bus driver): When my kids were young, they skated, but I’ve never been into it myself. The majority of the people here are very nice, but out of the eight days, I’ve had a couple that were not so nice [laughs]. But that’s normal. When you’re hauling that many people, there’s always a few that get a little rowdy when things aren’t going the way they want them to go, but other than that, it’s been beautiful. Michael Parsons (novice ice dance champion with Rachel Parsons): It’s been fun. I’m not done because we have a show, so we have practices and stuff, but it’s good to be done competing [laughs]. I was at Spokane last year, and there were more people because it was in a city, but this is fun, I like it. There was room for improvement [in his performances], but we did OK. My partner is my sister. We fight, but we don’t usually take it on the ice. We just get on the ice and practice really hard. Our coaches pick our music. We can give them an opinion, but, like, it doesn’t really matter, I’m pretty indifferent [laughs]. Next year we’re moving up to junior and hopefully we’ll do well there. Douglas Razzano (senior men’s competitor): My short program was very exciting, to have three years of mediocrity and finally do something incredible that I was so proud of. That was the best feeling, and to see people standing was like the cherry on top. At the 2008 nationals, I had to skate right after Evan [Lysacek], and Frank Carroll was standing right by the ice, and this [stuffed animal] came right down and hit Frank. That was a pretty good short program, but, yeah, that was funny. Arlene Nelson (Douglas Razzano’s mother): I always feel like if it’s going to be great, I want to be there, I have to see it. How bad would that be, if he puts out the skate of his life and I wasn’t there to see it? 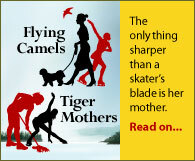 I love [being a skating parent], but it’s extraordinarily stressful, every step of the way, because you always want your child to go out and do their best. So I feel like I’m out there with him, because we’re very close. We were lucky, the timing was very good for us. He got into skating after watching the 1998 Olympics, and he decided he wanted to try it. And I said, wait until the end of the year, we’ll get you a good pair of skates and you can start when the school year ends. And that was the summer of 1998, and he just kind of toiled at the lower levels, and when it came time to switch him to a higher-level coach, at that time Doug Ladret came on the scene. Douglas: I don’t really know what at the Olympics inspired me. I just watched them and I wanted to try it. Arlene: He was doing gymnastics at the time, and then he just said to me one day, after watching the Olympics, I want to do that. And I said, okay, but you have to wait until the school year ends [laughs]. Jerod Swallow (ice dance coach): I know that ice dance, when our generation was skating, we were trying to redefine the discipline. We had gone through a transition where Torvill and dean had kind of set the standard for creative direction, and we were all after that and trying to aspire to that. And the ISU felt that it was too liberal, we weren’t defined enough in the ice dance discipline. So we had to rein ourselves in and try traditional styles so that we fit their expectations. So I think there was a lot of searching for couples in this country that could do that, and it took a number of years to sort out a group that were going to be around and that got support through the Association. And we emerged as a couple that they supported, but also we were fortunate enough to be part of a generation that could make a living in the sport. It was a short window, but skating just blew up, and fortunately in this country we had a lot of opportunities. And instead of staying in and riding out the lifetime achievement award, if you will [laughs], we decided to take advantage of the professional side of that. But I would like to think that the younger generations realize that Americans can be competitive and that it’s a discipline that’s respected. And certainly after we finished we saw that competitors were staying together longer and eventually getting into the medals at the Olympics. But I think that the US gaining respect internationally, that took years to establish. Even before Liz [Punsalan] and I skated, when I was at Nationals in seniors with another partner, the compulsory dances were longer. They were three to four sequences long. So if you drew, for example, the Tango Romantica, it was three repeats of a pattern at a minute long, so that’s three minutes long, and that’s a junior free dance, or a novice free dance. It was more like, ugh, the effort. But we were in much better shape, and that was a long event. You can imagine 30 couples doing that dance. I don’t think there was a dance we dreaded doing, but we loved the Golden Waltz. It’s the most challenging compulsory dance, but it’s also the most fulfilling, because of the music. It’s demanding because you have to train to be ready for that dance, but when it’s done well, it’s beautiful. I think our generation that was doing that dance became better dancers for having to do it. Ben Agosto (Skate Radio commentator): Speaking on the Skate Radio has been an absolute blast. I don’t think I’ve ever had as much fun watching skating as I’ve had here, just spitting out useless information about it [laughs]. They told me they wanted it to be as if the audience was just sitting next to me in the stands, and I was just kind of telling them what I was thinking and what I was seeing. I didn’t have to worry about talking over the program too much, because they can just take the earpiece out if they don’t like it. And so I could just kind of wax nostalgic about the past, and educate people on why things were difficult, and what the features the skaters were doing to try to get the levels. And we could see on a screen in real time what levels were being called as the features were being performed, so I could say, oh, they’re doing this and this and this, so they’re going for Level 4, and — they got Level 4. O,r they didn’t hold this long enough, so they got Level 3. It was a lot of fun. When we were competing, we knew when things would be downgraded, or it would be more like, oh, I hope they didn’t see that [laughs]. The rules, you study them and you practice them, and it’s funny, when I studied them to speak about them, it took me a little while to get into the stride of remembering specifically what they were doing, because when I was competing it was something that I could just do naturally. It was like, it had to be second nature, but now, starting to remember, oh yeah, you pick up the girl and you have to hold her position for three seconds to get the level, but if you take too long picking her up or putting her down, you don’t get the level. Those kinds of things were stories that I tried to tell so that people could understand what was happening. Ice dance is getting much more acrobatic, and there are going to be injuries we’ll start seeing that haven’t been a problem before. But back injuries are just kind of a part of ice dance, especially with the lifts. You can’t just put the girl over your head and hold her with your arms, you have to maneuver her body around you and deal with a lot of lateral forces, as opposed to just a straight up and down loading on your spine. I’ve struggled with back problems my whole career, and thankfully I’ve never had neck problems, even with the kind of lifts we do now when Tanith [Belbin] hangs on my neck and kind of swings around. I’ve had a sore neck but never any neck injuries. I really liked watching the short dances this year. When they first came up with the idea and we saw some demonstrations, I was a little bit concerned because it was such a jarring change from the choreography to the compulsory and back again, and I was like, oh, how is this going to flow? But I really like that we’re seeing the compulsory dances like the Golden Waltz, and it’s still a very easy way to see everybody, they still do the same steps and it’s a good comparison. But seeing it done to different music, it keeps it more entertaining and it shortens the competition for the athletes. I remember a few competitions where we did compulsories and the original dance in the same day, and it just made the whole competition better because you only had to get up and energized twice instead of over three days in a row. It’s nice to see that compressed and to see everybody get the chance to focus and do the best they can. My favorite dance and least favorite is the same one, it’s the Golden Waltz [laughs]. It’s interesting because it’s got so much variety, but it’s the hardest dance there is. It’s the most challenging in an interesting way because it’s got all these changing holds. You could almost throw a lift in there and it would be a pretty up to date original dance or free dance. That being said, it’s really hard to do and I hated doing it because it’s so difficult [laughs]. But it’s the dance I felt like my skating grew most from working on it. Working so hard and feeling it improve was one of the most enjoyable aspects of skating. 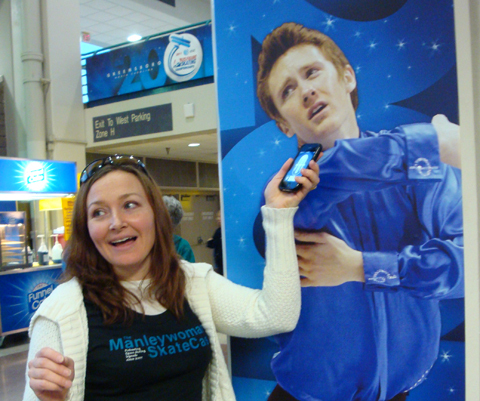 Allison Manley (podcast host): So now I’m at the airport after an exhausting but super fun several days at Nationals. I ran into so many people that I didn’t even get a chance to interview for one reason or another. But I hope you like the interviews I did get. We had a blast. So until next time, may your spread eagles be as deep as Jonathan Cassar’s; may your quads be fully rotated; and, can you believe it, I made an entire US nationals without once hearing Carmen. Bye-bye! great job on the nationals. keep it up girl. thanks for your continued passion for this sport. Previous post: Congrats to Debashish and Brian!